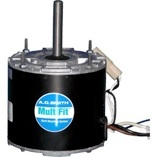 Mix and match any combination of motors to qualify for discounts on A.O Smith condenser motors. Receive a 5% discount on all other motors (reg. price) with your purchase of 6 or more motors.